The survival of the Tasmanian devil (Sarcophilus harrisii) is threatened by devil facial tumour disease (DFTD). This transmissible cancer is usually fatal, and no successful treatments have been developed. In human studies, the small immunomodulatory molecule imiquimod is a successful immunotherapy, activating anti-tumour immunity via stimulation of toll-like receptor-7 (TLR7) signaling pathways. In addition, imiquimod is a potent inducer of apoptosis in human tumour cell lines via TLR7 independent mechanisms. Here we investigate the potential of imiquimod as a DFTD therapy through analysis of treated DFTD cell lines and Tasmanian devil fibroblasts. WST-8 proliferation assays and annexin V apoptosis assays were performed to monitor apoptosis, and changes to the expression of pro- and anti-apoptotic genes were analysed using qRT-PCR. 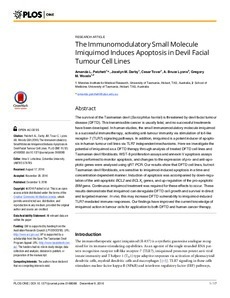 Our results show that DFTD cell lines, but not Tasmanian devil fibroblasts, are sensitive to imiquimod-induced apoptosis in a time and concentration dependent manner. Induction of apoptosis was accompanied by down-regulation of the anti-apoptotic BCL2 and BCLXL genes, and up-regulation of the pro-apoptotic BIM gene. Continuous imiquimod treatment was required for these effects to occur. These results demonstrate that imiquimod can deregulate DFTD cell growth and survival in direct and targeted manner. In vivo, this may increase DFTD vulnerability to imiquimod-induced TLR7-mediated immune responses. Our findings have improved the current knowledge of imiquimod action in tumour cells for application to both DFTD and human cancer therapy.